MANILA, Philippines – Two current world champions, a rising gymnast, and the gold medal winners in the 2018 Asian Para Games lead the list of major awardees who will be honored during the Philippine Sportswriters Association Annual Awards Night on February 26 at the Manila Hotel. Reigning IBF super-flyweight champion Jerwin Ancajas, WBO counterpart Donnie Nietes, World Artistic Gymnastics Championships bronze medalist Carlos Yulo and the Philippine Para Chess team – along with fellow Asian Para Games winners – make up part of the 23 major awardees to be recognized during the special event. 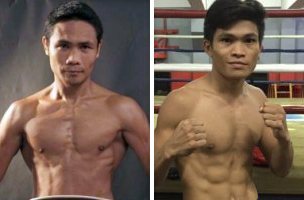 Ancajas defended his IBF 115-pound belt three times last year, while Nietes won the WBO belt just before the turn of 2019 in Japan. Yulo, for his part, is the first Filipino and Southeast Asian male gymnast to win a medal in the world meet. The Philippine Para Team, meanwhile, won 10 gold medals in Jakarta. Para swimmer Ernie Gawilan, Arthus Bucay (para cycling), Kim Ian Chi (para bowling), Sander Severino (para chess), and the Para Chess Team (Standard P1 men, Standard B2-B3 men, and Rapid B-1men are members of the national team that accomplished the country's best finish yet in the quadrennial meet. Other recipients of major awards are: Thirdy Ravena (amateur basketball), San Miguel Beer (pro basketball), Meggie Ochoa (jiu-jitsu), Christian Tio (kiteboarding), El Joshua Carino (cycling), Arnel Mandal (wushu), and the pair of Jannery Millet and Milo Rivera (motorsports). Completing the list are: Team Manila and Tanauan Little League (softball), Philippine dragon boat team, O’Neal Cortez (Jockey of the Year), and Sepfourteen (Horse of the Year). A total of 75 awardees make up the 2018 honor toll list led by Athletes of the Year Hidilyn Diaz, Yuka Saso and fellow Philippine women’s golf team members Bianca Pagdanganan and Lois Kaye Go, and Margielyn Didal. Bowling great Bong Coo and cycling champion Paquito Rivas are the year’s recipient of the Lifetime Achievement Award. Meanwhile, bestowed with special awards are June Mar Fajardo (Mr. Basketball), Marck Espejo (Mr. Volleyball), Jaja Santiago (Ms. Volleyball), and Neil Etheridge (Mr. Football). Olympian and bemedalled athlete Bea Lucero-Lhuillier will be the special guest speaker in the traditional awards night organized being held by the country’s oldest media organization.